Artistically Speaking: And home again! We're home! Back in (stinkin' cold) Vermont! Absolutely missing the families, but enjoying being in our own space again. Of course, this morning it actually snowed, and I for one was ready to leap back in the car and head south. But that's not happening, so instead I bought potting soil and planted what will hopefully be our wedding flowers. Spring in the north is good too. This is Mt Picachu (excuse me, Picacho is the real name - Picachu is what I always accidentally call it, oops! Thanks Sarah! ), between Tucson and Phoenix. Those jagged southwestern mountains are endlessly fascinating. It's not Picachu! That's a little yellow Japanese guy who will give you seizures. 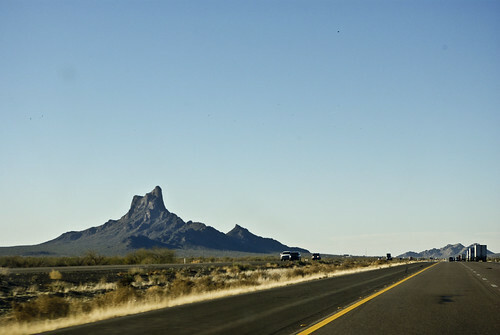 It's Picacho Peak. 20 minutes from home, and the turn-around spot for my "freeway driving" lessons when I was 16.